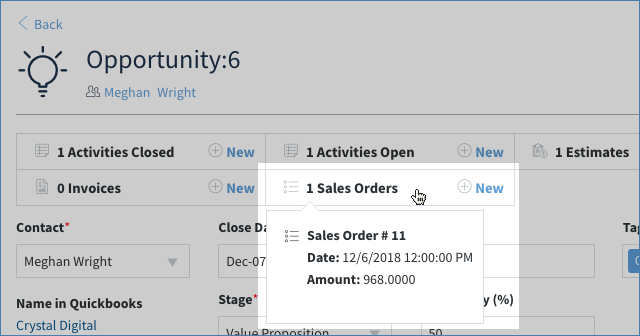 How to create a sales order in Method. 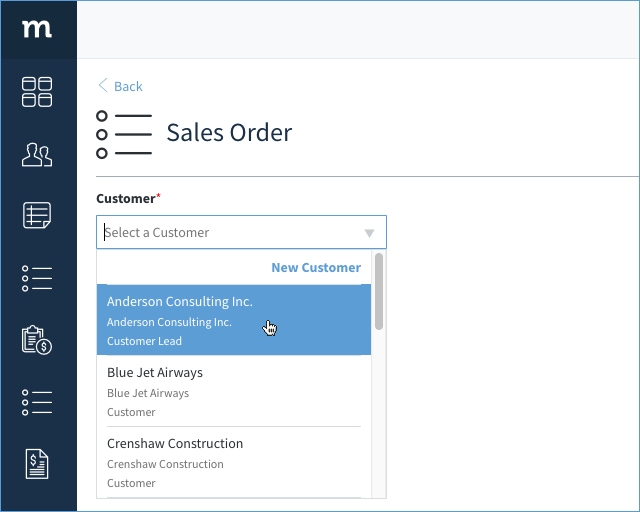 A Sales Order can be created in Method using the Sales Order App. This article will explain the different parts of the Sales Order screen. 1. Click ⊕ New on your Sales Orders App, or click ⊕ New Sales Order from your Sales Order List. 2. This opens your New Sales Order screen. Choose a customer to associate with this sales order. 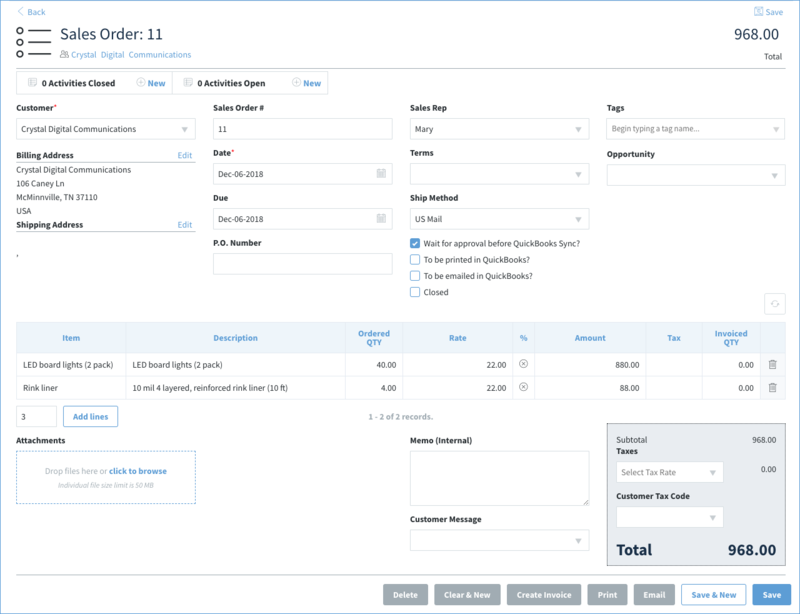 Sales Order #: Created if the field is left blank, and is assigned sequentially (if the last sales order was #15, this will be #16). Date* and Due: Today's date appears in the Date and Due fields (these can be changed manually). P.O. Number: Assign a purchase order number if applicable. Terms: Assign terms to this sales order, if applicable. Ship Method: How the order is being shipped. 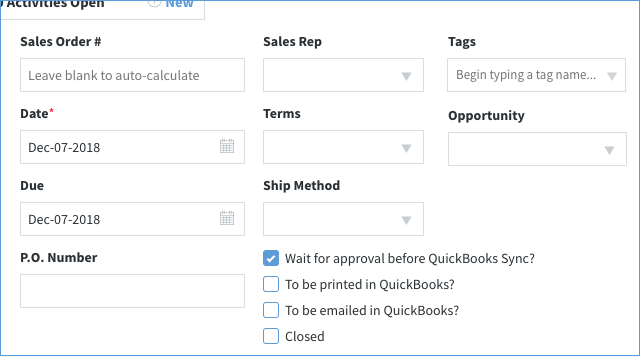 Wait for approval before syncing: Prevents the sales order from syncing to QuickBooks until a user unchecks this option and saves. To be emailed in QuickBooks: Flags the sales order in QuickBooks as "to be emailed"; group and email multiple sales orders in QuickBooks. To be printed in QuickBooks: Flags the sales order in QuickBooks as "to be printed"; group and print multiple sales orders in QuickBooks. Closed: Marks the sales order as closed. Tags: Assign tags to this sales order. Opportunity: The opportunity this sales order is linked to, if applicable. Line items are added to the Sales Order using the Line Items grid. Items available are taken from the Items App which is synced with your QuickBooks account. By clicking on a row, each column (other than the Amount and Invoiced QTY) can be edited to fill in details for each line item. 1. To add QuickBooks items to this sales order, add them directly in the grid. To add more lines, select the Add Lines button (not visible in image). Note: In many cases, a sales order is used to track materials needed to complete the job (e.g. a 1 hour plumbing job might require a new drainpipe and washers to complete, so the sales order tracks that information). You can also include service items, but many sales orders deal with product items. Note: Notice that the Invoiced QTY field is left blank - that’s because there’s no invoice yet! Line items are not saved until you save the whole Sales Order. If you updated the line items and log out of your session, they will not be saved in the Sales Order. Attachments - You can add a file to this sales order. Memo - Note to yourself and Method Users with access to this sales order. The memo is not visible to the customer. Customer Message - a message to appear on your sales order for the customer to see (e.g. "looking forward to your business"). Taxes - applicable tax rate. This was likely set up within QuickBooks. Customer Tax Code - the tax code assigned to the customer. Delete - Delete the sales order. This cannot be undone! Clear & New - Clear the current sales order so it is empty and you can create a new one. Print: This will bring up a pdf document of the sales order for printing. Your pop-ups must be enabled for Method, else the document will be blocked and nothing will happen when you click this button. The pdf is created using a template chosen within your app preferences. Email: Email the customer a link to their portal where they will be able to view the sales order online. A preview of the email will be visible before sending it out. Save & New: Save the sales order and clear the form to enter in a new sales order. Save: Save the sales order. If this sales order is being created as part of an ongoing opportunity, please follow these steps. 1. From your Method dashboard, click Pipeline on your Opportunities App. This opens your Opportunities List screen. 2. Locate and select the opportunity you wish to link this sales order to. You can search manually or use the search function at the top of the screen. This opens the Edit Opportunity screen. 3. On the Opportunity's app ribbon, select ⊕ New beside Sales Order. 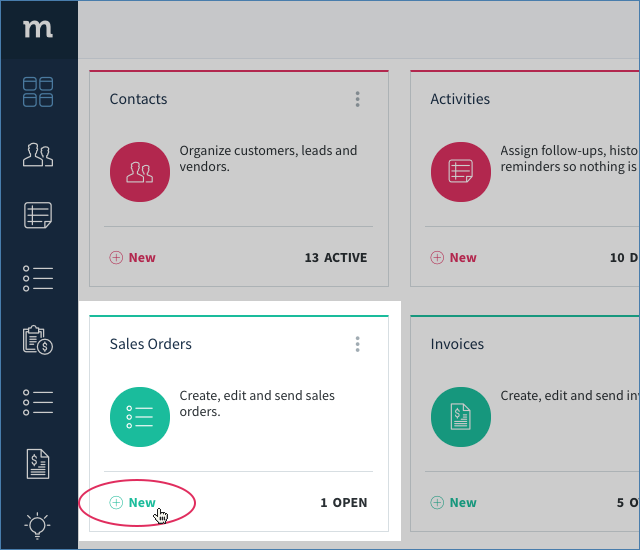 This will take you to the new Sales Order screen where you can create a new sales order.